My column from last week’s Catholic Weekly. “I’ve written my wish list for Santa,” one of my daughters informed me while we drove to school one day last week. It took me a second to remember that this was something they did towards the end of the year. I think it was someone’s classroom activity one time and thus a tradition was set. “I told her she’ll probably only get the pack of cards,” her sister commented drily. The year seems to be racing to an end, speeding up suddenly as it often seems to at this time of year. I would love to stop everything for a few days to get my bearings before we go plunging into the whole advent and Christmas season. We don’t get to do that though. But at the moment I’m really appreciating Sunday Mass as an opportunity where time literally does stop still and I can come up for air. Last Sunday we were all able to stay together – our little Isaac didn’t need to be taken out to the crying room or the foyer. That Mass time is really the only time and place in the week where the seven of us physically stay in such close proximity for a whole hour or so and with a common purpose. There’s no other activity which makes us come together like that. Meal times come closest, but often one of us is out of the house, or goes off to help a little one to the bathroom or begin washing up or something else. And meal times are short and simple affairs in our home because children usually don’t linger but want to finish up quickly and go back to playing. And we parents want to clean up quickly and get on to the next thing. I’m perplexed when I hear a Catholic say that they can’t afford the time to take the family to Sunday Mass because they need some time together and Sunday is the only day left available in the week. Sunday Mass is our prime family time! It is probably much more significant than we even realise in keeping our family on a fairly even keel most of the week. We have exactly the same issues as some others do in getting their children to Mass of course. Neither of us really enjoys getting everyone up and out the door in time for the 9am Mass, which is our least painful option at the moment. Sometimes there are tears and tantrums before we all get into the car together. Not infrequently we hear that “Mass is boring”, that “I don’t want to go”, and “Do we have to go?”. We try to keep our responses light and cheerful, and ignore the sullen faces on those occasions. I tell them it’s the most important thing we do all week, and how we feel about it doesn’t matter too much. I know that this is true. It doesn’t give me a sense of accomplishment or satisfaction to attend Mass with my husband and a clutch of young children. At times it’s with a grim sense of having survived the week. I have bursts of gratitude. Mostly I don’t feel anything but am occupied with trying to focus on the readings, homily, and prayers. I know it’s the only time in the week when I rarely notice the time pass. It’s the only time in the week when I’m not obsessed with what I’m doing, and what I have to do next. 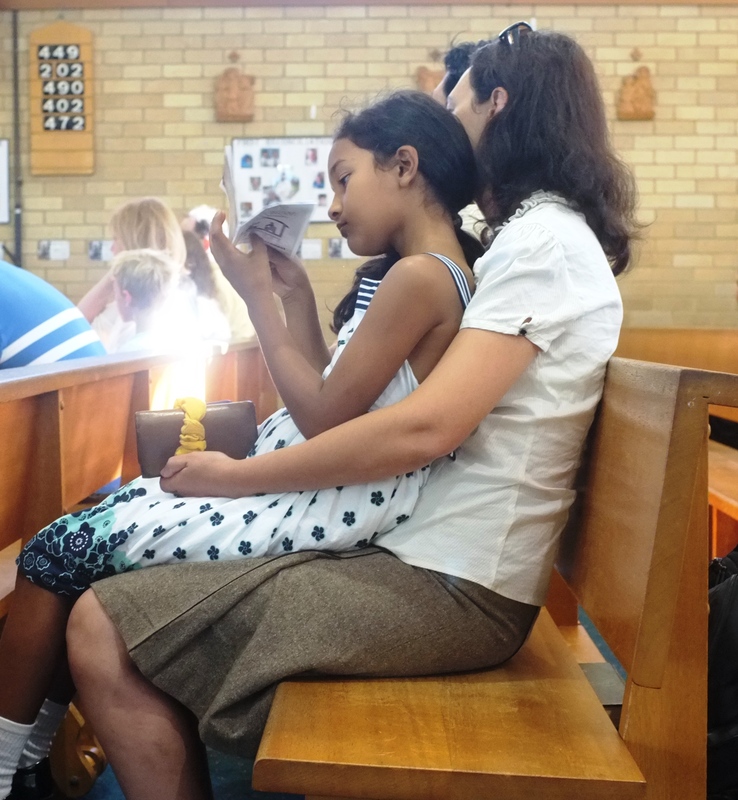 The quiet family quality time, the mental and emotional breather, even the brief catch-up with friends outside afterwards; these are bonus blessings we get with our Sunday Mass attendance. Like items I’d put on a wish list that, after everything else that happens at Mass, I would never have expected to get but very much appreciate.